There's a lot of confusion about whether oatmeal helps relieve constipation or makes it worse. Some people think oatmeal is one of the foods that cause constipation. Others swear that oatmeal is a good laxative. So which is it? The short answer: oatmeal can definitely lend your insides a free and easy feeling by keeping your digestive track active. What's more, eating oatmeal may help you lower your cholesterol, lower your blood sugar levels and maintain a healthy weight, according to a study published in the Journal of Food Science and Technology in February 2015. Understanding more about the types of fiber and their respective benefits can help you make better dietary choices. Eating a diet high in fiber is one way to limit your risk for constipation, according to MedlinePlus. Insoluble fiber, found in whole grains, legumes, fruits and vegetables, is particularly beneficial for this purpose. This type of fiber adds bulk to your stool and traps water to make your stool softer. Because soft and bulky stools tend to move more easily through your digestive tract, eating oatmeal can help keep you regular so you don't become constipated. The fact is that oatmeal has two kinds of fiber: soluble and insoluble. Soluble fiber binds loose stools. That's why oatmeal, like bananas, is good to eat when you have a stomach bug that may be causing diarrhea. But bananas, which are also binding, are high in a soluble fiber called pectin, which can slow your digestion. Oatmeal's high insoluble fiber content can help keep the traffic moving through your gastro-intestinal tract. By contrast, bananas--especially ripe ones — may constipate you. That's why oatmeal is no friend to constipation. Each cup of regular or quick oatmeal prepared with water contains about 4 grams of fiber. That's about 16 percent of the daily value of 25 grams. Of this, about half, or 2 grams, consists of the insoluble fiber that is helpful for preventing constipation by drawing water into the bowels. The other half consists of cholesterol-lowering soluble fiber. Although a high-fiber diet can help prevent constipation, if you increase your fiber intake too quickly and don't also increase the amount of water you drink, it could actually cause constipation, bloating, gas or diarrhea until your body gets used to your new, higher intake of fiber. Eating more than 50 grams of fiber per day can also interfere with the absorption of certain nutrients, such as calcium, iron, magnesium and zinc, according to the Mayo Clinic. Exercising about half an hour each day and drinking plenty of water — at least eight glasses per day — can also help keep you regular, according to the National Digestive Diseases Information Clearinghouse. Don't try to hold in your bowel movements; go to the bathroom whenever you feel the urge. Otherwise, you may stop feeling this urge. Sometimes it helps to use the bathroom about 15 minutes to 45 minutes after you eat breakfast. Check with your doctor to see if any medications you are taking may be causing your constipation. 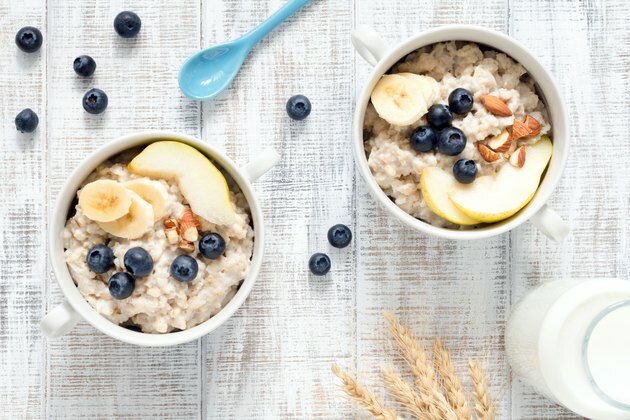 Can Eating Porridge Help Me Lose Weight?